The most exciting development in television technology showcased at the 2010 Consumer Electronics Show was not 3DTV, but web-connected, widget-equipped television sets. Another week brings revelations that don't feel like revelations - when will we know what we know? 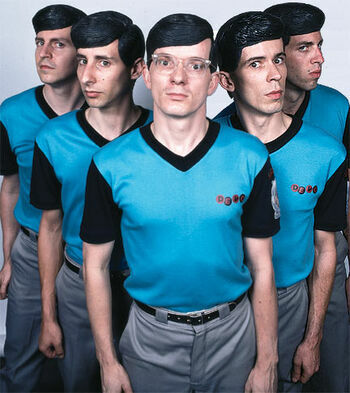 Devo's forthcoming studio, long play release is their first in twenty years and return as a working act comes in a new era where "de-evolution is real and Devo is normal". Where Pam and Jim (a couple whose sweetness is wonderfully conveyed by the fused appellation “Jam”) are associated with mild and often toothless critiques of the corporate regime, pulling pranks and expressing symbolic (and frequently non-verbal) opposition to or incredulity about the absurdities of corporate life, Dwangela perform a more substantive critical function. Like much about video game culture, New Super Mario Bros. Wii is profoundly nostalgic. In a sense, Mayer has become his own cultural intermediary. He is a meta-star text sustained in large part by his own mediatory endeavors. This has its benefits, but also poses problems for the many John Mayers jockeying for control over the text. The latest ideological skirmish will be played out through a History Channel mini-series on the Kennedys by conservative producer Joel Surnow. The problem, though, runs much deeper than shoddy history. It is rooted in a fundamental epistemological divide between left and right over what constitutes truth and how we arrive at it. Is Jacob the mystical SysOp of Lostpedia? Or is he just a teacher looking for a substitute? What's in a name? Hasbro and Discovery begin branding efforts for their new joint venture cable network debuting later this year. Is it all Downhill from here for Winter Olympics? Olympic winter games are a rudiment of a bygone modern era of (television) culture. Whereas summer games have adopted to changing viewing habits, Winter Olympics have essentially remained fifteen ways of sliding.